In commemoration of the annual global Safer Internet Day, Helo, India's leading regional language social media platform, launches #HeloSaferInternet, its latest campaign to create awareness amongst its users for a safe and secure internet in India. Originally initiated by the European Commission in 2004, Safer Internet Day (SID) is celebrated globally to create a better internet for everyone, and especially for young users. 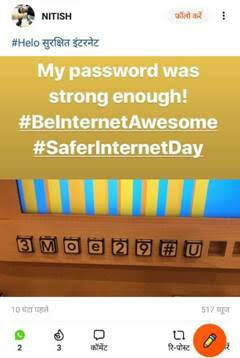 This year, Safer Internet Day is being celebrated on 5th February 2019. A number of NGOs, parents associations, industry associations, and tech companies have registered as SID supporters. These organizations support SID by hosting campaigns or launching safety resources. 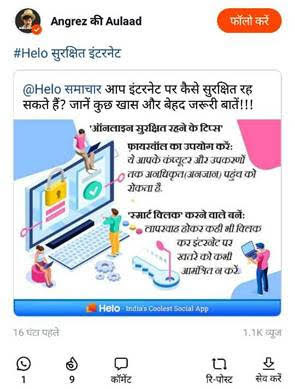 As part of the campaign, various celebrities and local influencers have shared posts and videos with their followers, with various regional language hashtags including #HeloSurakashitInternet (Hinglish); हेलो सुरक्षित इंटरनेट (Hindi); Helo இணைய பாதுகாப்பு (Tamil); Helo సురక్షిత ఇంటర్నెట్ (Telugu); Helo ഇന്‍റര്‍നെറ്റ് സുരക്ഷ (Malayalam); Helo ಸುರಕ್ಷಿತ ಇಂಟರ್ನೆಟ್ (Kannada); Helo ਸੁਰੱਖਿਅਤ ਇੰਟਰਨੇਟ (Punjabi); હેલો સુરક્ષિત ઇન્ટરનેટ (Gujarati). Ensuring online safety is a priority for Helo as the platform seeks to provide the best product experience for its 25 million monthly active users nationwide. Helo users can choose whether others can comment or share their content, reducing risks of content infringement and ensuring that content remains only for the personal consumption of users. Users can also choose to report content that they believe violates Helo’s Community Guidelines. Moreover, Helo takes misinformation and fake news very seriously. Its local content review and moderation team works very closely with the operations team, covering the 14 languages available on the platform. The moderation team harnesses machine learning algorithms to review and take down inappropriate content that violates its Community Guidelines, which clearly warn against the uploading or sharing of fake content, defamatory content, spam, intellectual property infringement, among other forms of malicious activity. To further safeguard the platform against the threat of fake news, Helo has also recently partnered with Alt News, a leading non-partisan fact-checking partner authority. This partnership involves a series of training sessions conducted by Alt News to equip Helo’s local content moderation team with their proprietary tools and methodology to identify and mitigate the threat of content from unverified sources. 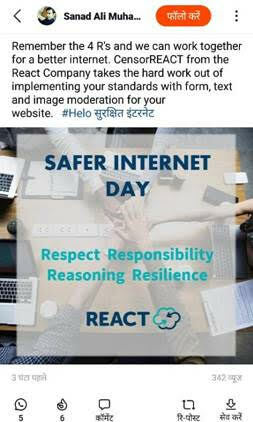 Share your views and say #HeloSaferInternet!